(NAN)The UN High Commissioner for Refugees and the Economic Commission of West Africa States (ECOWAS) have called for urgent need to tackle the migration crisis affecting the sub-region and protection of persons of concern. Both organizations made the call during the opening of the fourth ECOWAS Ambassadors’ retreat on Monday in Uyo with the theme: “Mixed Population flows and durable solutions in the ECOWAS Region”. The News Agency of Nigeria (NAN) reports that retreat brought together stakeholders and ECOWAS Ambassadors representing the Member States to discuss the phenomenon of mixed movement within the sub-region. The retreat also aims at deliberating on important regional issues and to advocate for the implementation of relevant policies in the Member States. Mrs. Liz Ahua, UNHCR’s Regional Representative, said that displaced persons in the West Africa sub-region present a new challenge that would only be resolved by joint action of all. She said that West African countries host a growing number of Internally Displaced Persons (IDPs) with Nigeria hosting the largest population of IDPs in the sub-region and Burkina Faso becoming a new theatre of displacement. Ahua said that finding solutions for persons forcibly displaced including refugees, migrants, asylum seekers, and stateless persons remains the priority of the UNHCR. “These challenging times continue to test our resolve, threaten progresses made but I am sure that together we can rise up to the challenges, resolve conflicts and secure an enduring peace for the greater good. 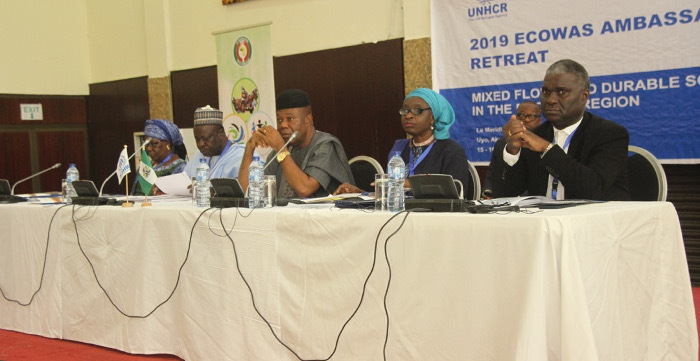 “Since its inception twelve years ago, this retreat has been one of the foremost regional initiatives in the achievement of UNHCR-ECOWAS partnership outcome and it is central in promoting UNHCR’s mandate. Also speaking, Mr. Jean Kassi Brou, President, ECOWAS Commission, said that the theme of the 2019 retreat was apt given the challenges facing the sub-region with the movement of its citizens to Europe. “This calls for the development of a relevant regional and country-specific legal frameworks, high-level advocacy and sensitization for the implementation of existing protection related frameworks. Brou said that there was a pressing need for stakeholders including Ambassadors to create a conducive political environment to push for the ratification, domestication, and implementation of relevant protection laws in the Member States.